I have to say that I, like many people, have a strong aversion to soggy bread. It’s gross and I don’t eat it—ever. This salad, however, is not soggy, and it’s not gross. I’ve seen versions of it in many cookbooks of late, and I think it’s a bit trendy among the gourmet types right now. Don’t let that deter you from trying it, thinking that you are a “regular food” eater. It’s delicious and, yes, okay it’s healthy too. Cube 1 loaf of crusty bread. Dice 4-5 tomatoes and 1/4 red onion. 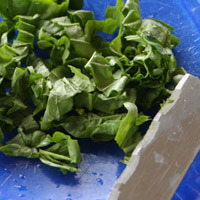 Slice 3 sprigs basil into thin ribbons. Combine all ingredients in a medium bowl. 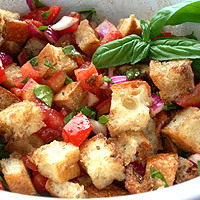 Drizzle Extra Virgin Olive Oil over the salad until just moist, about 1/4 C. The bread will taste soggy if you add too much, so only add enough to lightly dress. 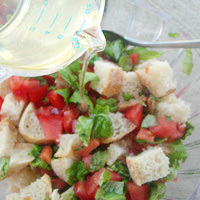 Drizzle about 3 T Balsamic Vinegar over salad. Again, this is to taste. Too much liquid will result in soggy bread. Add a pinch of salt and cracked pepper. I like to toss with my hands. It's more fun and Earthy. 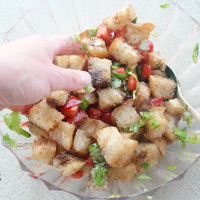 Let marinate for 15 minutes and serve with extra basil. Cube 1 loaf of crusty bread. 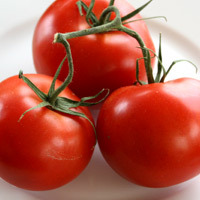 Dice 4-5 tomatoes and 1/4 red onion. Slice 3 sprigs basil into thin ribbons. Combine all ingredients in a medium bowl. 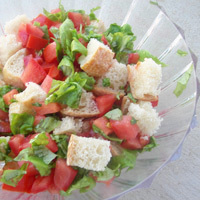 Drizzle Extra Virgin Olive Oil over the salad until just moist, about 1/4 C. The bread will taste soggy if you add too much, so only add enough to lightly dress. 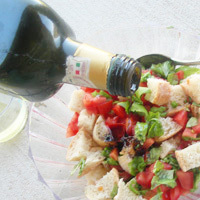 Drizzle about 3 T Balsamic Vinegar over salad. Again, this is to taste. 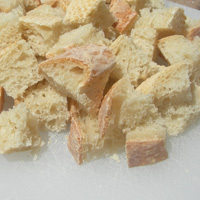 Too much liquid will result in soggy bread. Add a pinch of salt and cracked pepper. Toss and let marinate for 15 minutes. Serve with extra basil.